The MaxScore and LiveScore Editors were designed with microtones in mind, with the capability of representing pitch with virtually unlimited precision. The editor offers notation in various staff styles, quarter-tone, eighth-tone, 12th-tone and 16th-tone and Extended Helmholtz-Ellis JI Pitch notation among them, as well as cent precision playback via MaxScore Sampler or MaxScore Fluidsynth. 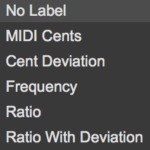 Pitch Tool’s floating palette will let you transpose pitch by cent increments and/or just ratios. The Pitch Tools allows you to set as well as add notes and intervals in terms of just intonation ratios. Add Note adds a note in respect to the current key area (C major if no other key area is specified) and octave range (4 = one-line octave). Therefore, if you select “3/2 perfect fifth” the note will be G in C major and E in A major. Set Pitch sets the pitch of a note or interval in respect to the current key areaand octave range. Add Interval adds an interval in respect to the current key area and octave range. 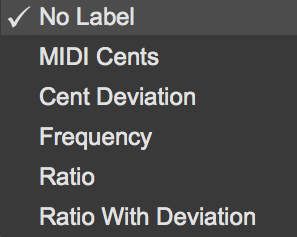 Stack Interval adds an interval in respect to the selected note or interval. 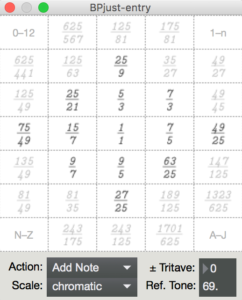 Transpose transposes a note/interval by the amount expressed by the ratio. A ratio can also be defined manually if not contained in the interval menu. Choosing “enter manually” on the top will open a dialog letting you define the desired ratio. Use the up/down button to set the ratio and its direction. Each note can also be labelled either according to its pitch, frequency or ratio in respect to given fundamental. N.B. labels will need to be updated manually if the pitch of the note changes. nTET-entry: Keyboard for equidistant tunings. 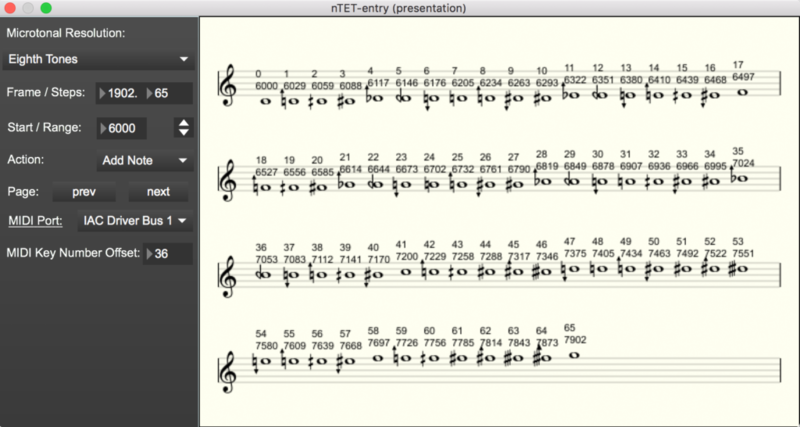 The nTET-entry tool can be used to input pitches of equidistant scales within arbitrary frame intervals. Its Action menu contains following items: Add Note, Add Interval, Set Pitch, Set Transposition Interval, Play Thru, Approximate and Copy Scale. Add Note adds a new note, Add Interval adds an interval to an existing note and Set Pitch changes the note/interval to the desired pitch. 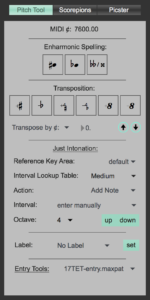 Set Transposition Interval set the Pitch Tool’s transposition interval to the interval between the clicked pitch and the first note of the tuning. When Play Thru is selected the pitch will be heard with note entry and Approximate allows you to approximate selected notes to the pitches of the chosen tuning. 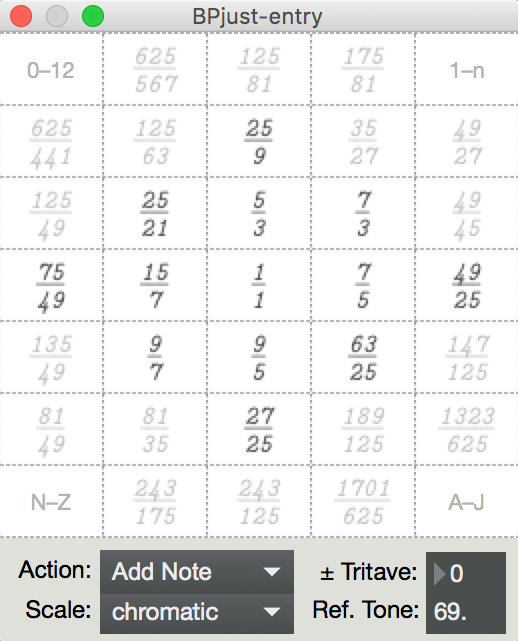 Copy Scale puts all pitches on the MaxScore clipboard from which they can be pasted into other scores. A Bohlen-Pierce Just Intonation diamond created by Todd Harrop. User-created keyboard for the input of Easley Blackwood’s study in 23TET. In order to listen to his piece, find “23 notes.XML” in MaxScore/examples/Scores. In the MaxScore Combo patch open the editor, open the file and load the 23-Tones.json preset file into the MaxScore.FluidSynth2 player to experience multi-timbral playback of music in non-standard tuning.